Looking for a good source of calories for a high-fat, high vegetable diet? Currently my diet is "paleo influenced" - most meals consist of eggs, salad, and/or cooked vegetables with meat about once per week (usually pork tenderloin, sometimes steak). To up the calories, I add tahini and olive oil to just about everything. I use coconut oil for cooking, but it's less appealing as a topping like tahini or olive oil. Since olive oil and tahini are both high in PUFA, what can I substitute with a better FA profile? Any other suggestions on how to execute a "low/no meat" paleo diet? Questions/comments/concerns about this type of diet are welcome. Did you ever start that thread? I've been going back and fourth on whether I should sweat the O6:O3 ratio more or less. For instance, I love me some avocados but when I brought up PUFA concern in a thread I was laughed at. What's the O6:O3 ratio in Avocados? Whats the difference between PUFA and O6? Thanks for sharing the link, this perspective on protein balance and ammonia toxicity is interesting. As for fat sources, I agree Grok would mostly not have olive or coconut oil. But if you are making substitutions, then you are relying on the biochemistry, which at this point I think is still very patchy. Had not heard of these vitamins, but it looks like both can be sourced from eggs and organ meats, which seem like things that Grok would eat. Perhaps its time to look for a source of organ meat. I tend to agree with Matt, in fact I wanted to start a new post with thoughts on O6/O3 ratios. Genotype may play a role. My ancestry is mixed, but from the way I look most of my genes come from Central Europe. I also eat like a Mediterranean in summer (more vegetables, less fat and meat) and like a Northerner in winter. But I find that, just for myself, I feel better when the ratio is 4 or lower, which may be due to ancestry. Organ meat does not contain enough Omega 3. Re: saturated fats, I think they can be eaten in large, unrestricted amounts, coconut or tallow. macadamia oil, which has flavour (do not put in fridge as it starts to thicken up a bit). mct oil, which has pretty much no flavour, remains liquid even when if kept in fridge (tho does not need to be kept in fridge). Realistic omega-6:3 ratios aren't uber-low, they're probably around 10:1. You won't get uber-low ratios until you either A) eat an extremely PUFA deficient diet (i.e. no fats but ruminants or coconut) or B) eat a crap ton of fish. Neither of which is all that natural or makes sense in a human evolutionary framework. The same idea follows for total PUFA in the diet. <4% total calories as advocated by some folks is ridiculously low. We're talking closer to 8-10% of total calories as a reasonable level. Glib - thanks for your input. But doesn't this raise some questions about the optimal ratio? Clearly not all paleo people had access to fish. Can organ meat contain more OM3s? Also if I understand correctly tallow will contain mostly saturated fats, which according to some, are actually better than PUFA/MUFA for various reasons. Any thoughts on saturated vs. unsaturated fat? I'm doing something kind of like this. Not exactly avoiding meat but not going all out either. I've only been Paleo for a few months but have obsessively learned a great deal about oil. My first question is: Where's the butter? I use a LOT of butter. Especially if it's from a grass fed source. Also: don't worry about olive oil. It's got a lot of MUFA but very little PUFA. I have little experience with beef tallow but I hear about it a lot. There's also clarified butter or "Ghee" to consider. I also keep hearing about red palm oil or the likes but haven't tried them. If you're on the more wealthy side, consider special things like macadamia nut oil, Palm Kernal Oil, Shea Nut Oil, or Avocado oil. Palm Kernal and Coconut Oils contain lots of Medium Chain Triglycirides - these are generally thougth to be "good"! If you're feeling "creative" you can make some pork oil by frying up some crispy bacon and keeping the grease for later, though this has a bit of PUFA as well and it's clearly damaged PUFA after all that frying. Avoidance of excessive protein is prudent as it may lead to extended life span. I'd be curious to see where this thread goes as I have the same questions. I've been reliant mainly on butter, coconut, and olive fats as well as very fatty meats and stews during my short intro to Paleo but I'm ready to evolve to another level. This thread could help! I've read reports on some other studies and clyincal trials. The most convincing involved insects and a protein/carbohydrate ratio which is hard to port over to fat-loving humans. Thus I leave it at "may" increase life span, but I'm fairly convinced after my readings. I think the PHD website will probably link you to some of the other studies but I was reading the book, not the website (haven't read my link). As for butter not being available to paleolithic peoples - I try not to get too carried away pondering "would grok eat this? Could grok even access this food?" 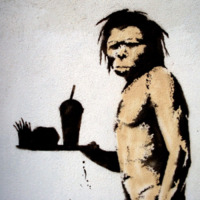 since the Paleolithic ideology, to me, is more of a blueprint or skeleton of the perfect modern diet. We have many good nutrient sources available to us that they didn't, and could never get some of the things they accessed regularly. Most of us will actually have to supplement things like vitamin K2 and vitamin D3 to reach levels approaching what they would encounter, and supplementation is definitely not Paleo. I don't think refined olive oil or coconut oil are all that paleo either :-) Still excellent sources of fuel for modern humans. I think that 12:1 is, in fact, terrible for a main source of fats. Numbers I have seen for olive oil are 8-10:1, and for avocado 14:1 Omega 6/Omega 3 ratio. That is not a solution either. Butter is of course a solution, as are grass fed sheep cheese, goat cheese, and tallow. I find that sheep cheese stuffs my nose, but I can eat the other two without restrictions and in fact I consider goat dairy superior to cow or sheep. A word about lard: even the most pastured pig will have to eat something like acorns, which will produce a ratio of order 10 at best (acorns have no Omega 3, but some will sneak in from eating weeds). The same goes for most pastured chickens and eggs (they have to eat some grains). So you can not escape fatty fish in all its forms, and ruminant products, if you want to keep the ratio below 4. Methodician - thanks for your input - these are great suggestions of fat sources. I would question whether ghee (and especially butter) qualifies as paleo from a theoretical (rather than biochemical) perspective (i.e. paleo people probably did not consume butter). Talo and the other oils are great suggestions that I will look for in the store. Another thing that just occurred to me - perhaps consuming organ meat would also provide a good fat/calorie source? I'm curious about the fat profile of liver, kidney, etc. As far as the low meat - extended life span correlation, do you have any further source or information on this? The reason for me to switch away from eating meat every day was that my workouts are much better on a reduced meat diet (less lactic acid and pain during intense excercise, e.g. rowing timetrials, crossfit workouts and other intense interval workouts). I have not seen any negative impacts (in terms of weight or muscle loss) from drastically reducing meat intake. I probably get most of my protein from eggs and tahini. Olive oil is not high in PUFA. It's approximately 10% PUFA by calories, the spectrum of dietary fats, that's pretty average. Even the omega-6:3 ratio isn't terrible: 12:1.